In the more northerly regions of Britain, “saga” is a word conjuring up something of our Viking forebears and their stirring escapades. The word originates from the Old Norse or Icelandic. In Icelandic the word means: “some­thing said” or a “narrative in prose”, somewhat along the lines of a “story”, a “tale”, or a “history”. It still stands with its tower – pronounced as” structurally sound” by a structural engineer – as it was built, apart from the crowning stone ball replacing the original lantern. And the unroofed (by order of the Northern Lighthouse Board after 1806) adjoining build­ing remains as a substantial and attractive ruin, showing the mason’s interesting internal stonework. One room (6.5 by 4.7 metres) is obviously a living room, but the other, a later addition (5.1 by 4.9), is puzzling in that it features a roughly constructed, uneven, cobbled floor, such as is nor­mally used for animals, amounting to more than three-quarters of the floor space. It also has the remains of a fireplace with chimney. The building and tower are about 11.8 metres distant from the high water mark and stand only about 1.5 metres above – measurements to be seriously considered with the recent sea-rising predictions as a result of global warming. When the 70-foot-high lighthouse was built in1789, it must have indeed been a spectacular sight for the 420 or so inhabitants living at that time in the island. It would have dominated the flat landscape with its scattering of little crofts. Had the lantern been a revolving one instead of being fixed (which caused more shipping casualties) it might have lasted longer than its short operational lifespan of 17 years or so. This letter is an attempt to clarify some points, respond to arguments, and encourage discus­sion about the future of the building and North Ronaldsay’s continued survival. Those who admire the Old Beacon made their views clear in a survey distributed by the North Ronaldsay Trust round the island last October/November, when just on 90 per cent of the island expressed an opinion. This is a very high figure, indicative of the intense interest by the community (compare the recent OIC elections where only around 50 percent voted). Decisively, on the overarching question of whether the Old Beacon should be left more or less as it is, apart from some necessary repairs, 35 out of 39 people (90 per cent) who voted on this question want to leave as it is. Just four people wanted to go ahead with changes to the tower. Similarly, 75 per cent of those voting were in favour of leaving the Old Beacon’s associated buildings as they are. The overwhelming majority feel, as I do, that the monument is special and should be preserved as it has come down to us over the decades. I’m afraid that the result of the “survey”, though decisively clear, is almost totally being rejected by the directors of the North Ronaldsay Trust (most of whom do not even live from day to day on the island). An argument, continually reiterated by the trust, is that the development at the Old Beacon is important to the future of the island economi­cally. The directors say there will be: extra planes – for the workers who will transform the build­ing; extra boats (for materials) and more tourists; work for new islanders etc. This, it is said, will keep “everything” going for another three or four years as this work progresses. Another reason – a so called “moral” one – propagated by a few, is the argument that some 70,000 people, out of Britain’s population of 65 million, voted in the BBC Restoration Village programme for the Old Beacon restoration. What indeed is that in percentage terms? Where is the moral reason for ignoring between 75 percent and 90 per cent of islanders who want the Old Beacon left as it is? Are they less significant than the 70,000 votes out of 65 million? The proposed development (if allowed) entails the transformation of the remains of the living quarters into at least one three-star grade self-catering cottage. Underfloor heating is proposed, with hidden storage heaters and unobtrusive light­ing, with toilet, shower and electric power; a car park; safety railings, access for people with dis­abilities; some form of protection against the sea, which twice in the past forced a family to leave the building when storms, with high tides, flooded their home. A stairway with preferred access to the top of the tower is another desired feature. To change the still spectacular ruins of one of the first, and the only remaining original of the first four Scottish lighthouses is, as an art school col­league of mine, of years ago, put it, “sacrilege”. The proposed Old Beacon project is an ambitious undertaking, costing probably more than two million, with many hurdles to overcome i.e. planning permission from OIC, approval by SEPA and Health and Safety authorities, and permission from agencies such as the Scottish Government, Ancient Monuments Scotland and Historic Scotland. At the end of the day, a few years down the line, if the money becomes available and the full devel­opment goes ahead, what will the island be left with? It will have a monument, once admired and loved by generations of island folk, visitors and decades of tourists in the past, changed mainly into another self-catering cottage in an island which already can cater for over sixty visitors through existing services: Bird Observatory, guest house, and at least five self-catering estab­lishments (some with three and four-star status) and other advertised accommodation. All of these places in a small island are hard enough to maintain financially. Yet, it seems that grant-giving bodies are being actively pursued, and even convinced, to award public money for another self-catering facility. It is, to my mind and many others, a short-sighted, unnecessary, venture, which will detract from already estab­lished businesses. It will, if it happens, develop the Old Beacon into something it never was historically for a very few months in the summer time. Will it bring more young families into the island? I don’t believe so, for they require houses to live in. Where is the independent business plan for such a transformation? Where is the convincing justi­fication? I have not, so far, heard a very construc­tive argument — although it has been asked for on numerous occasions. Another part of the argument put forward is that if two million pounds is available, then just take it – even if the Old Beacon project can’t be justified. But surely the starting-point for everything has to be to target all effort, all thought, all energy, on what is needed to transform North Ronaldsay, and then to seek the money for it; and grants are available for many worthwhile projects apart from modifying ancient monuments. And one much more disturbing argument is the so far unfounded one (after repeated requests for information) that the three main bodies involved – Endemol/BBC Restoration Village Programme, OIC (who supplied funding) and then Estate/Rinansay Trust – have signed agreements with those who would pursue this controversial project, insisting that the restoration idea must go ahead. I have seen written statements from all three bodies, which deny the existence of such agreements. And is it morally acceptable that grant-giving bodies award public money for com­munity development of up to two million pounds or more, to a project that would, after 26 years, revert back to its original owners, a private trust? If there is “division” on the island – as is claimed – over the Old Beacon issue, it’s not the first time. Generations ago, a far more serious division occurred with the break-up of the Established Church of Scotland, in 1843, at the time of the Disruption, which involved the island. Another important island issue voted upon was the decision to have the Royal Mail carried by plane (Capt. E. E. Fresson) instead of by sea. There are other examples. But in the case of the Old Beacon, what the island wants has been made indisputably clear. There is not a large division on this issue. Important is the “criteria” statement by Highlands and Islands Enterprise, who empha­sise the importance of community participation in decision-making. Open consultation (stipulated by all the major grant-giving bodies) within the community is what they advocate. This was done in 2006, when the development officer of the time visited every household on the island and drew up a comprehensive ten-year development plan. This contained many good ideas put forward by people in the island, but no action ever seems to have been taken on it, by the appropriate agencies, in these past five years, and the document has now vanished from sight. Last week, the first public meeting to be held in the island on the subject of development in over six years took place. No early indication locally was given about the importance of the meeting; no information as to who would be present was provided until the day before the event, and no indication of who had called the meeting. It is possibly not surprising that of the 58 or so adults on the island only 21 attended. The meeting was hosted by Rory Dutton, devel­opment officer north for DTAS (Development Trusts Association Scotland), who talked about the work of Scottish Trusts, including the North Ronaldsay Trust. Other officials were: marine archaeologist Ted Pollard, who talked on several aspects of this subject and the Old Beacon; Luke Fraser, OIC development officer, who dealt with issues of development, and housing in particular; and Leslie Burgher, chartered architect, who pre­sented a report on the ambitious plans for the Old Beacon. Those presentations, including an account of the North Ronaldsay Trust’s achievements by one of its directors, John Tulloch, took up most of the meeting. Housing was an important issue discussed – apparent from the many suggestions in an island questionnaire and very much along the lines of my ideas below. Gateway housing was another alternative talked about – successfully utilised in other islands. The presentation on the proposal for the Old Beacon did not mention the survey of island opinion, with its strong wish to avoid major alter­ations to the monument. The question for OIC and the grant-giving bodies is just this: do they see the absolute prior­ity for the island’s survival as a big development of the Old Beacon, so important that it must be forced through against the overwhelming weight of island opinion? Or, will they focus instead on the immediate needs of the island with an ageing population — to bring in more families? Would they instead be prepared to look at supporting a practical alternative, which could do some real good for the island? This would be to single out initially four or five traditional unused/derelict crofts that are close to water and electricity services and restore them in a way that follows sympathetically the continu­ity of the North Ronaldsay crofting landscape, while also incorporating the latest insulation and sustainability features. This should surely meet the aspirations of organisations such as Historic Scotland and the Heritage Lottery Fund who, in fact, should want to preserve the unique overall appearance of an old crofting community still virtually – com­pared to elsewhere – unspoiled, and so begin the process of real opportunity and regeneration. One old croft is, in fact, already being renovated in this way by someone connected to the island. And a number of others have been renovated over time in a way that fits well into the island’s character. Crofts restored in this way could be offered to young families who want to live in North Ronaldsay and can bring in their own work with them. Indeed, it could soon be possible to live in North Ronaldsay and commute to the Mainland as the island might shortly have an early morning and late evening Loganair plane service. That there are people who want to take up an island lifestyle has been proven in the Fair Isle situation, where there are always applicants for the National Trust’s advertisements for available crofts. Such potential new islanders are made aware of the limitations of work availability, and so arrive sensibly prepared with an alternative source of income. If only the main grant-giving bodies could forget about the Old Beacon and give instead funding for this kind of housing development, then they could make a real contribution to North Ronaldsay’s survival. OIC already have a new concept in erect­ing inexpensive but highly efficient, temporary kit houses, as explained recently to the North Ronaldsay Community Council, who successfully negotiated with Orkney Housing Association the building of two new houses. Incidentally, those kit houses can be dismantled and taken back to the Mainland if necessary. Five new families would boost the popula­tion by upwards of 20, with additional children attending the schools. If they should stay, then the “continuity of the North Ronaldsay crafting landscape” could evolve with restored traditional housing. Looking at it this way, for far less than the cost of the unwanted Old Beacon “theme-park” type transformation, the island could have instead five instant kit houses; a small, necessary surgery/waiting room and a modest care home for our ageing residents, giving immediate work for carers. Historic Scotland have preservation grants and, with other assistance, the monument can simply and inexpensively be preserved as most islanders and others prefer it should be. In Orkney alone, there are many historic build­ings and ancient ruins dating back thousands of years. They are maintained by a local conserva­tion team, approved by Historic Scotland. The work that is needed at the Old Beacon is a straightforward preservation job (including making secure the top of the tower) that abso­lutely should be done whatever happens. The building and tower has survived remarkably well for over 200 years without any attention and it is still impressive and evocative as a once-lived-in dwelling – more so with the unroofed nature of the place and the visible interior masonry construction. The Old Beacon should remain as it has come down to us — a unique and very impressive monument and the only remaining example of Scotland’s first four lighthouses. Simple conser­vation will ensure its iconic presence far beyond our lifetime. And other generations will have the opportunity to admire, use their imagination and enjoy the beauty, mystery and solitude of that peninsula, and that old tower and dwelling house, that once commanded the high seas to the west, the north, and between Sanday and distant Fair Isle. In 2006 (December 14), I wrote A Letter from North Ronaldsay entitled: Do we really need to restore the Old Beacon, or is conservation the best way to proceed? My letter offered an alternative point of view – conservation. It was written and published after the public voting – firstly in Scotland and then nationally – for the BBC Restoration Village programme. The BBC programme presented a plan for the Old Beacon (OB) that meant: almost full restoration of the monument; access to the top for the public; re-roofing the dwelling accom­modation; interpretation display; water and electricity; toilets; replica lantern, etc. In Scotland, the Old Beacon project came first, and nationally it came third. Money awarded from the winning Scottish entry, plus other money received, was used to fund an overall survey of the OB. Since the OB proposal did not win in the final vote, there are no further requirements, as far as I am aware, by funding agencies to undertake the restoration project, thus leaving the future plans for the monument open for debate. The money received was used for the overall survey: projected costings; erection of a scaf­fold by a firm from the South; purchase of the scaffold; inspection of the tower by a struc­tural engineer; removal of over 200 years of accumulated guano and prevention of further bird invasion. The reassuring result of the initial survey was that the tower and dome were pronounced “structurally sound” – no fear of the ball falling down. However, the engineer stated that, if there were to be a restored balcony for tourist access, then the badly-worn (in parts) walkway slabs would have to be replaced. Additionally, the engineer recommended pointing the corbelled roof structure, which carries the crowning ball. Since that time (June 2008), the unsightly, all encompassing scaffold, unused and visibly deteriorating, continues to face the elements in one of the most exposed and sea-spray inva­sive areas in North Ronaldsay. The very major work required (virtually rebuilding the top) for a new balcony is a major concern for Historic Scotland. Access to the top, either for the public or inspection purposes only, would entail strin­gent Health and Safety regulations with pro­tective railing, etc. How would such safety facilities compro­mise the 200 year-old historical and aesthetic profile of the top of the Beacon? This too is a concern for Historic Scotland. It should, perhaps, be remembered that the New Lighthouse (lit 1854) nearby has all the safety features in place and a viewing balcony at a height of 149 odd feet — over twice the height of the OB. The Old Beacon is a Grade A listed monu­ment. In Historic Scotland’s criteria, they talk about exceptional circumstances for restora­tion — where it can be shown to be the most viable way forward for preservation of the monument as a whole. Whatever proposal is submitted, it has firstly to be approved by Historic Scotland and, although they will consider restoration, their views regarding Grade A listed monuments, I believe, lean more towards conservation. For example, as long ago as 1996, an offi­cial from Historic Scotland said: “the accom­modation block was deliberately un-roofed in 1809, it would not be appropriate to re-roof it now; that would be both unhistorical (since the tower in its beacon phase did not require a keeper), and it would also involve an unac­ceptable amount of re-building”. Another statement from HS’s criteria says: “Restoration is also likely to be regarded as unacceptable at those monuments that are of outstanding importance for their scenic value in their existing state, that is, as ‘ruins in the landscape”. Sustainability into the future is also a concern for Historic Scotland, and for other funding bodies, if major renovation is undertaken. As Historic Scotland point out, what is required is: “. . . an informed understanding of the significance of the beacon and its con­servation needs”. Conservation, for which Historic Scotland can give grants from year to year, could be done relatively quickly. Such grants would certainly be awarded for a monument of such importance as the OB. If the necessary minor repairs to the struc­turally sound tower were carried out, such as pointing the structure upon which the ball rests; making safe the worn walk-way slabs (small pieces of flaking sandstone falling to the ground); and the relatively straightfor­ward conservation of the living quarters, then one would expect the OB to remain safe for the foreseeable future – over 200 years have passed without any maintenance and yet the tower is pronounced as “structurally sound”. Such conservation procedures would avoid the large sums of money required for the Restoration Village idea (originally estimated to cost upwards of £2m) and all the plan­ning permission, maintenance and insurance necessary. More than five years have passed since the BBC Restoration Village programme, without any decision having being taken about the OB’s future, although new ideas have been floated, such as use of the dwelling space as holiday accommodation, providing an 18th century experience, without water or elec­tricity, or developing it into a modern holiday cottage with four-star grade accommodation. It is said that those suggested changes to the OB (now actually described as a potential goldmine) would: “breathe life back into the island and sustain this unique community and their declining way of life”. This so far unsubstantiated prediction does not consider the “aesthetic” argument con­cerning the monument – one which Historic Scotland continually brings into focus. Would, for example, re-roofing the Earl’s or Bishop’s Palace, Noltland Castle, Skara Brae or any of the island brochs in Orkney, or other historic building remains, be acceptable or indeed allowed? As mentioned in my first letter, the sea has invaded the OB’s dwelling area on numerous occasions, and has been seen happening; a stone-built sheep “pund” (trap) only a few feetaway from, and adjoined to the buildings, has been severely damaged on numerous occa­sions and, indeed, twice fairly recently, with the sea obviously flooding the area. This fact of sea incursion is mentioned in Peter A Tulloch’s book, A Window on North Ronaldsay, where he talks about a family who temporarily occupied the obsolete dwelling house having to twice “leave the dwelling hur­riedly when storms with high tides flooded their homes”. With the predictions of global warming and the subsequent rising of sea levels, sea-invasion will become an even more serious problem. No doubt some form of protective struc­ture could be constructed to avoid flooding the “up-market accommodation”, but at what additional cost, with what guarantee of safety, and how out of keeping with the monument would it be? Since 2006, and some years before, the North Ronaldsay Trust (NRT) (which is also involved with the future of the OB – leased for only 30 years to the NRT by the Estate) has completed the work of renovation of the New Lighthouse complex both inside and out. It included providing facilities for the instal­lation of a wool-mill for processing the wool from the North Ronaldsay native sheep, which has been up and running, successfully, for some years. But the main part of the project involved the restoration of two self-catering cottages, interpretation display, shop and a small restaurant. They are all beautifully finished, with the four-star status cottages available for self-catering bookings. The NRT is also involved in the ongoing renovation and maintenance of the two island churches. The success of, and responsibility for, all of these projects is surely quite a challenge as we move ahead into difficult and unpredictable financial times. Numerous establishments now exist on the island giving generally first class accommoda­tion for over 60 guests. Included among those establishments are eight self-catering cottages. Tourist accom­modation is important but, as has been said for the past 50 years or more, “what the island requires is houses, jobs and young families”. If this can be achieved then hopefully it might “breathe life back into the island….”. Very encouragingly, just recently we learned that the OIC are apparently considering the building of a further two homes on the island. There are many unsightly, derelict crofts on the island and an almost intact, but obsolete, grain mill that could be renovated. Develop them, maybe, as restored, typical North Ronaldsay crofts that people could live in, and the mill in some positive way (possi­bly a working museum). At least they are safe from the sea. 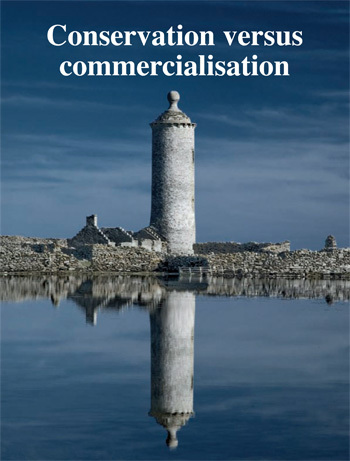 More than five years have passed since the Restoration Village competition; the community, who should be consulted about the OB and the development of the island, could no doubt come up with innovative ideas for North Ronaldsay’s future without irrevocably altering the appearance of the monument and its spectacular setting. What seems to me lacking, as Historic Scotland say, is: “an informed understanding of the significance of the beacon”. Surely the evocative photograph taken by the photographer, Dawid Grudzinski, which accompanies this article, conveys wonderfully the magnificence of the OB as it has come down to us for a period of over 200 years. Over those past 49 years, I have painted countless sea and landscape views of the island, and, over the years, the OB has often been the subject of my work. Many a creel morning, late or early, rough days or calm days, my fishing partners and I have sailed past its monumental presence, set creels round it — not much more than a good stone’s throw from the tower. It stands there like some great guardian of the past on that picturesque, untouched and iso­lated peninsula of Dennis Ness, unchanged for more than 200 summers and winters, watching over us and the passing years. The thought of creating a painting of that familiar and inspiring monument with restored roofs and all the inevitable Health and Safety features surrounding the area is abhorrent to all my sensibilities. The monument will be neither one thing nor another; neither fully restored nor fully con­served, for the very questionable and, as yet, unproven purposes of generating revenue. In my opinion it will be done at the expense of compromising the timeless, commanding and mysterious presence of one of the great and enduring icons of North Ronaldsay. This is April 21 and a fine day it is, with light north easterly winds. The Fair Isle, lying some 25 miles away to the east, was clearly visible yesterday, but today it has disappeared in a slight sea haze. But the day, though cool, is most pleasant and I’m sitting down at my “writing machine” once more. Over the weekend great have been the festivities and yesterday, tidying-up day, proved particularly entertaining, with the world and North Ronaldsay being put to rights! In the evening, when I was back home, I was ready for a peedie nap. It was a bit like the time I fell asleep one hot summer’s day long ago in a rather unique piece of ground called the mire, which has never been cultivated. I was trying, unsuccessfully, to identify different grasses. When I awoke some time later I wondered, like Rip Van Winkle, where I was. I had the same initial feeling on this occasion for in the time of my greatly extended nap, the moon and the stars had risen and moonbeams lit up my darkened kitchen table. At this stage, long past the heuld of the night, and refreshed with a “cuppa,” as Mary o’ Burray used to say, I idly turned on the television to see what new worldwide calamities, shenanigans and corrupt goings-on were afoot. I eventually ended up (arguably not very constructively) watching an old-fashioned American gangster film, where good triumphs over evil. You know, nowadays, many folk no longer know the difference between good and bad — that’s the trouble! He’s not that very far wrong even more than 200 years later. Anyhow, after the film, and still feeling as fresh as a daisy as a result of my over-long sleep, I could see the glimmerings of the dawn in the eastern sky. I thought, out I must go to experience the sights and sounds of an early summer’s morning. Yes, to be up and about, watching the dawn unfold is certainly worth the effort. Often, during lobster-fishing days such sights were very common. As it happened the moon was full but of low elevation. What a sight she was, glowing warmly like a lantern in the southwest, and further south the planet Venus shone palely. Ancum loch, not far away and towards which I meandered, still reflected the bright flash of the lighthouse. The air was full of the sound of bird-life. From different directions I could hear at least three snipes, or “horse-gowks,” as they dived steeply groundwards above established territory with their outer pair of tail feathers giving that unique, unmistakable tremulous sound. If there is a memory of spring and early summer, then it has to be, for me at least, the thrumming of the “horse-gowk” and the piping of the “whaup,” or curlew. And all around came the voices of lapwings, oyster catchers, curlews and black-headed gulls. Sadly, only a few of that latter species are to be heard by the loch edges, from which coots and wild duck added to the morning symphony. As I walked back home a blackbird was singing and the far away sky, a pale rose colour, brightened gradually as the morning crept ever nearer to the rising of the sun. So here I am today, aiming to tell you about our Saturday evening’s entertainment. Shall I begin by mentioning Walter Traill Dennison (1825 – 1894) the Sanday writer and folklorist described by Hugh Marwick as a “man of unquestioned genius”? Ernest Marwick noted that “he saved from extinction, single-handed, a whole corpus of myth, legend, and historical tradition . . .” Dennison’s Orcadian Sketch Book came out in 1880. In 1904 Orcadian Sketches, with a subtitle Traits of Old Orkney Life was published. Other works were printed in the Scottish Antiquary (1891-1894) under the title Folklore: Sea Myths. To these major writings, as Ernest says, must be added his Orkney Weddings and Wedding Custom. Ernest goes on to mention other writings by Dennison, which can be read in his very full and informative introduction to Orkney Folklore and Traditions, published in 1961, by the Herald Press, Kirkwall. It is upon this old folk tale that Sidney Ogilivie based his Saturday night’s production in the Memorial Hall, calling it Assipattle and the Stoor Worm. A little like the gangster film, mentioned above, many of those tales relate to the triumph of good over evil. And the story of the sea monster, the Stoor Worm, being vanquished by the hero, Assipattle, is typical of many folklore and fairy stories. The Mester (master: superior in all things) Stoor Worm was described as the most terrible of all living things on land and sea and at times he could only be pacified by being fed with seven virgins once a week. Assipattle, the hero, was always represented as the youngest son in differing versions of the tales (Assi — from lying in the ashes, and pattle — from the movement of his feet and hands to and fro). So the plot unweaves, with many turns and twists with Assipattle, as Dennison says, beginning in ridicule and degradation, but rising to the challenge and ending on the highest summit of earthly glory. And so round this tale, told in many versions at the firesides of old, Sidney Ogilivie wove his little concert, sketch or whatever, adding various other characters to enhance the action. After hearing a few of those entertainments over the years, it is clear Sid has a fine talent for writing this type of production. Despite many difficulties with preparation — players off on holiday in Australia, France and Edinburgh, and others not even on the island for practising, plus extras being roped in at the last minute — everything on the night seemed to work like clockwork. The costumes were original, entertaining and colourful; the dialogue (with clever adaptation from the original tale) was very creative; innuendo, witty observations and swift scene changes resulted in a presentation enjoyed by children and adults alike. Of course, Assipattle with his high hopes cleverly destroys the Stoor Worm, saves the Kingdom, marries the King’s daughter, Gem da Lovely (rescued from the Stoor Worm), and all live happily ever after. The Players, who closed by singing High Hopes, were: Assipattle, Alison Duncan (who sang two lengthy solos); Stoor Worm, Sid Ogilivie (with Norman Bayley adding two legs to the monster’s elongated body); Good King Harold, Jen Batten; Queen, Kevin Woodbridge; Sorcerer, Paul Brown; Assipattle’s mother, Norman Bayley; Princess Gem da Lovely, Heather Woodbridge (13); Princess Gem da Roughbit, Bob Simpson; Princes Gem da Biggerbit, Mary Scott (10); Princess Gem da Weebit, Lillian Gray (4); Sir Gawain, Anna Scott (13); Squire, Dawid Grudzinsky; Brother, Anne Ogilvie; King’s Messenger, Helga Tulloch; Guard, Ronan Gray (6); Lady in Waiting, Chris Sutcliffe; Narrator, Helga Tulloch; Costumes, Anne Ogilvie and Edith Craigie; Interval Music, Elaine Geddes and Lynn Proctor; Props and Scenery, The Cast. After the performance, Evelyn Gray, President of the North Ronaldsay Community Association, thanked Sid Ogilivie, his wife Anne, and all the actors, for providing an audience of more than 70 — including many friends, relatives, and visitors — with such fun and enjoyment. She also acknowledged the band, Three in a Bar (Lesley MacLeod, Fran Gray and Hamish Bayne) who had flown out with Loganair — the island’s lifeline — once again to play for the dance, which shortly got under way. Beginning slowly, it soon livened up to become a lightsome affair with Three in a Bar’s toe-tapping music. Three sets madly danced the Eightsome Reel, with Sinclair Scott on the pipes. Tea, sandwiches and homebakes were served, followed by the outcome of a raffle that brought in more than £150 for the Memorial Hall funds. By about 1.30 in the morning this event, highlighting, I hope, the name of Walter Traill Dennison, and bringing folk together for an enjoyable Easter break, came to a close. Today, Thursday, March 13, has been a wonderfully fresh, sunny day — a day of tingling, westerly winds, pale yellow primroses and opening daffodils. With thoughts, sights and sounds of spring, I felt I should write a “peedie” (I almost wrote “peerie”) letter from North Ronaldsay. More than a week ago, I heard a blackbird singing for the first time this year. And that very same day, when I was out walking, a flock of common gulls mixed with a few “haedie-craas” (black-headed gulls) came flying overhead and set away inland on the wind. This is the time of year when those gulls come back again. They always look very smart with their black heads, red legs and white plumage. To see them in great clouds following the plough or harrows, when the “voar” work was in full swing, was a fine sight indeed. I think those days of extensive ploughing will not come again. But they were lightsome days, when some 40 years and more ago, many tractors would be out ploughing “nort” and “sooth” across the island. And up and down the newly turned “paets,” clouds of birds, dazzlingly white in the sunshine, would rise and fall as they fed on thousands of twisting worms so rudely exposed to the “voar” winds. Not only are those returning birds making their presence heard, especially round the areas of Ancum, Hooking and Bridesness lochs, but the “tee-wups” (lapwings), one of my very favourite birds, are crying, as are the “sheldros,”’ or oyster-catchers and the piping “whaups” (curlews). And one other day, not long ago, I heard the common snipe drumming. The local name for that bird is the “horse gowk,” I suppose, because the distinctive, vibrating sound it makes, as it dives groundwards, resembles the whinnying of a horse. Well, today, I was out for another walk to enjoy the bracing westerly winds. Part of my travels took me past a little stream (mentioned before) that crosses the north road up to the school. It drains water from nearby higher ground and a little stone brig crosses the old path that existed before a new road was built. But the water still runs — strongly at this time of year — and I often stop to listen to its tinkling, bubbling sounds as it tumbles over stone, under a dyke at right angles, to travel south along the road drain. There is something very pleas ant and relaxing in the almost musical notes of running water. But more than that, it reminds me of far-off school days when life seemed much simpler and when never a serious or worrying thought crossed our minds. Thursday is Day Club day, when senior citizens enjoy a get-together and also enjoy a meal prepared by the newly appointed school cook, Evelyn Gray. Sometimes, since I’m now in the OAP category, I will go along simply for the enjoyment of the occasion, and especially for the opportunity to listen to talk of the old days by some islanders much older than I. Today, for instance, one subject turned over for a bit was Second World War mines. A number came ashore round the island during the 1940s and exploded. Those mines were extremely dangerous, though, fortunately, no islanders were injured. Windows were broken some distance inland depending on how the blast travelled. This happened to the Meal Mill which is some way from the shore. Nearer the exploding mines, buildings could be slightly damaged: cracks might appear in the plaster, or the building itself would be shaken. And certain parts of the beach would be noticeably scarred, with the damage visible long afterwards. Shrapnel would fly miles inland and pieces were found and, years later, bits of jagged iron could be turned up by the plough. Once, we were told, near Westness — a croft close to the seashore — a henhouse, not far from the exploding mine, was blown apart and plumage on the surviving hens (white leghorns) had turned a dull grey colour. Sometimes, mines would not explode and sometimes — at great risk, one would have thought — folk might remove large, useful iron shackles attached to the mine. Great risk indeed, for a mine disposal officer, who was for a time on the island defusing unexploded mines, was subsequently killed when working at the same job in Stronsay. Talk continued: singling matches of turnips when maybe a nine-acre field, at the largest farm on the island, Holland Farm, had to be worked. Many folk went with their hoes on those occasions. Or days in the harvest time when large fields of, mainly, oats had to be stooked and built into stacks. Such communal work — even helping neighbours or being helped — was greatly to be enjoyed, and especially at the end of the day, when there was food, drink and grand entertainment. I certainly remember the “hairst” time with many happy memories of those vanished days and nights. Then we talked about a man, Simpson to name, who often preached. His wife (Australian) I learned later was a missionary. In his younger days he had been a tea-planter in India, where, when working at a sawmill, he lost most of one arm. He wore plus-fours, my companions remembered. George, I discovered, was his Christian name and he actually died unexpectedly in Kirkwall after an operation. The local word, by the way, for such a clearance was a “rope” with the “o” in the word sounding more of an “au” sound (as in awk). The sale of most of the Simpsons’ belongings took place in the early 50s and I remember being there and coming home, with my uncle from Cruesbreck, in the moonlight. My late father bought some books at the sale that I well remember. They are still in the house. One especially frightened me as it told some chilling ghost stories. I’m just going to have a look at them — they were all large books (published late 1930s) with sinister black covers. The ghost story book cover is embossed with a black bat silhouetted against a faded golden moon. There are five books I see: The Mammoth Book of Thrillers, Ghosts and Mysteries (the one I remember in particular); Fifty Enthralling Stories of the Mysterious East; Fifty Amazing Secret Service Dramas; Fifty Great Adventures that Thrilled the World; and Fifty Strangest Stories ever Told. Other subjects came up after our lunch – too many to go into here – such as: George V1; Kitchener; Robert Burns and Burns Suppers; the wearing of plus-fours; the blitz in London; a male teacher in the 30s who belted pupils regularly; John Tulloch, from Hooking, who was aboard an armed merchant ship torpedoed in the First World War. He survived, returned to Hooking, married and farmed for many years. Later, he with his wife and brother, went to live in Stronsay, where he was drowned while fishing alone. Well, this, I said, was not to be too long a letter and so, to end, as I often do, I have been outside to see how the night has turned out. The moon, in its first quarter, shines fairly brightly, almost in the northwest, and stars sparkle. It always seems odd to me to see the moon shining and setting so far north. And, to use a word used by the poet Robert Rendall, I can hear the “swaa” of the sea upon which, to the west, the moonlight scatters. It’s certainly not been a busy day for me, but still my outing and discourse at the Day Club had led me down memory lane. I never thought that I should be looking at those old books mentioned above but you see how one thing leads to another. Will I — I wonder again — dare to read one of those horror stories? No, not at this time of the night — not by any stretch of the imagination. I noticed today, January 27, that the snowdrops are just beginning to show their little heads and, before I get this letter completed, February will be with us. How shall Candlemas Day (February 2) turn out, I wonder? Suddenly, the festive season seems very far away and that feels a little sad — something lost again to join with the many memories of the passing years when Yule was celebrated in great style. The other night I was making my way along the road to post some letters. The stars were bright and a fresh, strong westerly wind sharpened one’s senses. In the east, the moon, though almost half spent, still shone brightly. Sometimes drifting lines of dark cloud passed momentarily across her face. In a garden next to the road, tall spears of the now leafless willow tree, black against the sky, whipped sharply in the wind sounding like the sea on a “coorse” day. The stars and those black, moaning trees on one side and the moon on the other, as I briefly stopped and listened, gave me a very curious feeling. In one of Robert Burns’s letters he too mentions the wind in the trees and the effect of inclement weather. This year’s Burns Supper was a grand affair from beginning to end. How very enjoyable it is to sit and talk leisurely in the soft candle and subdued lighting that we create, waiting for the rather late North Ronaldsay starting time. And so, a peedie bit past the set time, the North Ronaldsay Community Association’s president, Evelyn Gray, welcomed the company including the guests. She went on to acknowledge the work of the many helpers who make such an evening possible. Then, in came the piper, Sinclair Scott, playing the pipes and the chief cook, Winnie Scott, carrying the reeking haggis — officially for the last time as school cook, since she retires within days. Round the darkened hall they marched — twice for enjoyed effect to the tunes of Highland Laddie and A Man’s a Man. Red, blue and green curtains of great dimensions decorated with tartan rugs, old barn riddles and neep baskets transformed the hall area into a place of comfort and old times remembered. Across the roof a canopy of red crepe and paper roses floated in fine white nets. After this colourful (Winnie in white blouse and tartan skirt) entrance and the quaffing of their respective drams by the piper and the cook, the haggis was deposited ready for the Address. In full highland rigout, Alastair Duncan, coming from Aberdeen, recited To a Haggis with fine verve and authenticity. His wife, Lynn, was also present. Being in a bit of a ‘dwaam’, a light-headed dream, I almost forgot to announce the Selkirk Grace but John Cutt was there as always. After the traditional supper, a knowledgeable and keen Burns man from Kirkwall, Bill Wilson, gave a particularly well prepared, well thought out and illuminating Immortal Memory. Being a past president of the Edinburgh and Leith District Orkney Association and a past president of the Glasgow Orkney and Shetland Association, and presently president of the Debating Society in Stromness, the tribute to Burns came effortlessly. Next, a married couple, Chris Sutcliffe and Georgette Herd, of Stromness, gave the Toast to the Lasses, and the reply, in very fine form. John Cutt, in his own and inimitable style, then recited two Orkney dialect poems written by Christina M. Costie (1902-1967). Standing in front of Robert Burns’s portrait, the accomplished fiddler, Lesley MacLeod played a selection of Scottish tunes, ending with the particularly beautiful and moving Neil Gow’s Lament for his Second Wife. Then, once again, came Burns’s Tam o’ Shanter. Howie Firth in cracking form, wearing a Balmoral bonnet and tartan shawl delivered this recognised masterpiece with great flair. The programme continued when the fine singer Hamish Bayne — one of the original members of the well known folk group, The McCalmans — sang The Lea Rig, accompanying himself on his own, hand-made concertina. His second song Ca’ the Yowes to the Knowes was accompanied by Fran Gray, who now resides in Longhope, on accordion. She, along with Lesley MacLeod and Hamish Bayne, form the group Three in a Bar. Lesley resides in Kirkwall and Hamish, whose wife Freda was also present, stays in Stromness. A short interval ensued to allow for further drams to be served for the last part of the evening’s Burns programme — The Toast to North Ronaldsay. This is one of the many special toasts delivered at the island’s first Burns Suppers, begun in the 1930s. We think it must continue and we think it deserves another dram. And so Howie (as toast maker) in a scholarly presentation talked about North Ronaldsay’s importance in the Saga times and down through history. He thought the island would live on and have a great future. Glasses, sparkling in the candlelight, were raised in the toast to North Ronaldsay. This toast ended our short Burns programme and the 13th Burns Supper since the NRCA’s resurrection of this enjoyable event, in 1996. More than 60 folk attended the function — islanders, former islanders and many friends from the Orkney Mainland — even a former islander from the USA. How very grand it is to be present, support and enjoy this event (for we absolutely do) and to appreciate the work and the fine efforts, freely given, of the association’s guest performers and other contributors to this commemoration of Scotland’s National Bard. Retirement presentations followed, marking in a way the end of an era, with the bowing out from public duties by three contemporaries, whose school days go away back to the 1950s. Head teacher Sue Gilbert and NRCA’s president Evelyn Gray came forward to supervise this pleasant occasion. The first ceremony was the presentation to the janitor, John Tulloch, and his wife Ann. John had been janitor for 20 years. Ann was invited to come forward to accept an inscribed clock and barometer and a set of Edinburgh crystal whisky glasses. Evelyn handed over the gifts and Sue, on behalf of the NRCA, paid tribute to John’s and Ann’s years of service to the community. She mentioned how efficiently their work had been carried out and also mentioned the many other supportive community activities with which they had been involved. School pupil, Cameron Gray presented Ann with a beautiful bouquet of flowers. Ann thanked everybody for the very fine gifts. She said how John and she had worked under five teachers in their time and how they had enjoyed their years at the school and the community centre, She was sure the new janitor, Marion Muir, would continue the good work. Winnie Scott, as mentioned earlier, was, within days, due to retire as school cook. This was a post she had held for 15 years. Again, Evelyn made the presentation handing over a beautiful, boxed Ola Gorie silver necklace with matching earrings. Sue, paying tribute to Winnie, praised her years of service — not only as school cook but also for providing meals for the Day Club and for the many functions at which she had officiated and for her work for the community. Sue and the school children had calculated that every year Winnie cooked well over 1,000 meals. Heather Woodbridge, a former pupil, now at the KGS, presented Winnie with her bouquet of flowers. Winnie thanked everybody for the beautiful jewellery and the lovely flowers. She said how she would certainly miss her days at the school and wondered how she would ever manage her retirement. Jeremy Scott then came forward and read two short, but quite unique retirement poems which he had specially composed – one for John and Ann and one for Winnie. With this pleasant, and memorable occasion at an end, the tables were swiftly cleared. And at once Three in a Bar struck up the music for the first dance, Strip the Willow. Everything got off to a swinging start and continued with one dance following another almost without delay. Many lively dancers on the floor gave an exciting feeling to the night. But missing this year was the sight of Bessie Muir and Howie, at some stage, up in a dance when Howie’s feet would move like lightning and his partner would also be going at it with equal agility. After at least seven or more dances Sinclair, playing the pipes, fairly dirled folk through an Eightsome Reel with many a heuch resounding through the hall. Tea, currant bun and shortbread followed. Then with a lull in the proceedings, with sufficient song sheets for everybody, a number of favourite Burns songs were grandly sung and as grandly enjoyed by the company. Songs such as Comin’ Thro’ the Rye, A Red, Red Rose, Afton Water, Ye Banks and Braes. Back to the dance again with continued enthusiasm until well after three in the morning when, hand in hand, that great parting song of Robert Burns, Auld Lang Syne, brought a wonderful evening to a close. Let me end with lines from this song that brings back memories of many a great occasion. Not all that many days ago I was sitting outside on the old seat (which I have often mentioned) at Holland House. From there one has a fine view of the North Ronaldsay Firth – the stretch of water that separates our island from Sanday and those further afield. Amazingly, at this time of year, maybe eight or a dozen flies danced up and down no distance from where I was sitting. If I hadn’t known that the month was December, or had I been Rip Van Winkle awakening after his long sleep, I might have been excused for thinking it was a summer’s day. Not only the presence of flies at this time of year was surprising but also the sun was quite warm as it shone brightly from a blue, windless sky. In fact it was the most beautiful day that one could wish for at this time of year. And, if I had allowed myself to nip 40 winks, I could easily have slipped comfortably into a little summery nap. Today, as I write on the second day of the New Year, there is a bitingly cold, strong south-easterly wind, and along the length of the east side of the island, powerful, breaking waves hammer the shoreline. Out at sea the dangerous Reef Dyke is a mass of white, tumbling water and vicious, cold rain showers, and sometimes hail, sweeps the island from time to time. It has to be said that summerlooking days and dancing flies in December are not at all good signs. Well, Christmas is past as is Hogmanay and New Year’s Day. All the main pre-festive activities are over once again. First, there was a whist drive organised to raise funds for the Christmas Eve party. That was followed by the island Christmas dinner provided by School Meals, after which the school pupils gave a lively presentation of mime and song. A goodly turnout greatly enjoyed both events. Christmas Eve saw the traditional bairns’ Christmas party, with the Santa Claus visit bringing pleasure and presents to children and adults alike. A Christmas carol service conducted by the Rev John Macnab followed a day or two later. How very pleasant it is to hear the old Christmas carols once again. Then, to celebrate the end of the year a little get-together, organised by the North Ronaldsay Community Association, took place on Saturday. Great was the discourse, food and company. A dance or two, from time to time, added to the evening’s entertainment. All of those events took place in the new centre glittering with decorations. And, this year, hundreds of little fairy lights added to the atmosphere, sparkling as if they were stars on a winter’s night. Hogmanay came and went with lightsome visits extending well into New Year’s morning. The old Standing Stone was also visited as a windy, cold New Year’s Day began to mirk. Celebrations continued with more visits here and there. A merry company had certainly brought in 2008 in grand style. I mentioned Rip Van Winkle earlier. This tale by Washington Irving of someone sleeping for 20 years or so poses interesting questions in terms of time and change — particularly for small vulnerable communities such as North Ronaldsay. Another writer, H.G. Wells, wrote The Time Machine. His Traveller in Time takes us far into the future to the year 802,701 One can relatively, easily speculate — given, for instance, a static population and given age statistics for 60 souls — on how North Ronaldsay might be in 20 years time. Without additional islanders we might easily become another St Kilda or another Stroma. The Time Machine is another business all together, though I will try to draw some connections. In the film version of this futuristic story I particularly liked the introduction of the Talking Rings. As the Time Traveller speeds through the centuries he stops his machine and discovers a race of people living in an apparently idyllic world — but they have lost all sense of responsibility and care little about their existence or the history of their past. Museums are filled with dust and decay and have no significance in this New World. Though books and manuscripts crumble into dust when touched, the Talking Rings still function. As long as they are spun and turn they tell, among other things, of the collapse of civilisation brought about by a nuclear war between the East and the West. Anyhow, this idea of the Talking Rings is interesting. They would be equivalent, I suppose, to today’s CD-ROMs, or the earlier reel-to-reel tape recorders which came into commercial use in the 1940s. Before that there was, of course, the 78 rpm vinyl records produced by the million. Recordings of speech and song date back to the early 1900s and just before. Being able, for example, to listen to the great voices of the past I always think is remarkable when one remembers that most of the singers are long dead and gone. When the relatively simple, but surprisingly good quality tape recorders became readily available they were used extensively. And Orkney was not slow to make use of these recording possibilities with a number of individuals using such machines. Thousands of hours of tape recordings — reel to reel recorders and the later cassette recorders — exist. They constitute a unique audio record from all over Orkney of oral history and the music and song of people long since gone, and performances of others now well on in years. The article goes on to list the many reasons for the deterioration of the tape — quality, poor storage, chemical breakdown and so on. Mention is made of ways in which deteriorating tape can sometimes be rescued. It also stresses the importance of professional expertise in the preservation and copying of those vulnerable tapes. When one thinks of the huge amount of material recorded in Orkney by such people as Adrian Stuart, Ernest Marwick, Ann Manson (when she worked as sound archivist at the Library) Sandy Wylie, Dougie Shearer, Radio Orkney, the School of Scottish Studies and the BBC, and, no doubt, many others, it is imperative that immediate preservation and copying work should be embarked upon before it is too late. I know that efforts are being made to acquire funds for this work. It is work that will take years, simply because of the sheer volume of copying and cataloguing required. Help, encouragement and effort from all quarters should be sought. Recently, I met up with one of the above collectors, Adrian Stuart — accordion, piano, organ and keyboard player extraordinaire — who was making his recordings mainly away back in the 60s, 70s and later. His dance band of those early years, made up, as he said, with some very fine musicians, featured prominently in the Orkney social scene. This audio record, made by many, is of an Orkney now vastly changed. Yet generations of Orcadians, and generations to come, will, hopefully, be able to listen, learn and study from the collection of all recorded material available. Among Adrian’s tapes, for example, there are recordings of dance bands, concerts, singers, musicians, and recordings of many other important occasions and gatherings, all of which give a fascinating glimpse into Orkney’s past. Remarkably, Adrian, has painstakenly, over a period of the last three years, transposed his own taped material onto CDs. This has been done with surprisingly little loss from tapes dating as far back as around the sixties. There still remains, he tells me, as much material recorded on the later cassette recorders to preserve in the same way. So now you see, bearing in mind all other collections, the enormous, overall task that confronts our archive departments. Let us hope that we do not become like the people discovered by the Traveller in Time — people who have lost all sense of responsibility, and care little about their existence or the history of the past. Let us be assured that our libraries and museums with their books, artefacts and archived collections do not fall into dust and decay, as the Time Traveller discovered, or that those institutions become under-financed in a fast changing world. Let us hope that the “Talking Rings” will be preserved and become publicly available. As I finish I am going to have a late, last night’s enjoyment of the festive decorations and some of my red Christmas candles still left to burn. Tomorrow, you see, is the Twelfth Night of Christmas. All day long, though the wind has decreased and “southerd,” a tremendous east sea dominates the winter landscape, and even now it thunders away in the darkness of the night. I still have most of my Yule visits to make before Aald New Year’s Day on the 13th. So there are a few folk left locally to whom I must say A Happy New Year as I do now to those who might read A Letter from North Ronaldsay. Well, the harvest moon has been and gone and so too has the time of the aald hairst days. I’m always a little sad when that time of year fades away. Despite the sometimes unpleasant, hard work of those days when, as I’ve often said, there were nevertheless great days and great memories. Even on the difficult days when crops lay raffled or flattened, folk working together could still enjoy overcoming such obstacles. And who of that workforce could ever forget the golden days when the sun was shining; when fields of golden corn and ripening oats coloured the Orcadian landscape; when the crop stood safe and ready for shearing, stooking and building into stacks. Such pleasant memories can never fade. And at the end of the season there was the abiding pleasure of celebrating the completion of the year’s harvest work. Yes, I know those days are in the past but the memories remain – important memories I may say, since working together with neighbours and others was very satisfying and gave real pleasure. It’s a pity that today’s young farmers, or other young people for that matter, will never experience such activities and never quite understand the enjoyment of those bygone times. So, in North Ronaldsay, though the alternative harvest of silage/barley wrapped bales and the like, gets done mainly much earlier in the year and no longer does one see and hear the clicking-clacking binder, or see the stooks and then hand-built stacks, we still like to have an old fashioned Harvest Home. Our hall decorations of mainly simmans and large ‘flackie’ designs made from straw —renewed not so long ago and so far lasting well. And the oat sheaves are now replaced with sheaves made from another, once much-used material, “stowers” (a tall coarse type of grass used to build-in and protect binders). Some say, as they maybe play the devil’s advocate, that those items are no longer appropriate. But such materials provide great decoration and they will always symbolise the harvest — however changed the produce might be — just as the red poppy of Flander’s Fields symbolises the sacrifice of those who gave their lives for freedom in war. Evelyn Gray, president of the North Ronaldsay Community Association (NRCA), welcomed the company and the guests and thanked the very many folk who had worked hard to make the evening possible. In addition, I made a short report about progress with Memorial Hall affairs. Tar had been purchased for tarring the building, as had road-repair emulsion for repairing the parking area in front of the hall. Two windows remain to be bought and installed. Perhaps, as I suggested, if we got another really good spell of weather we might still, this year, tar the hall. I noticed in one of the old minute books of many years ago a decision had been taken to carry out this work in the month of November. So we may yet have a grand tarring day. Jerry Wilson, recently retired veterinary surgeon, was our Harvest Home speaker. Jerry was accompanied by his wife Evelyn. The North Ronaldsay Community Association’s other guests were our man at the Orkney Auction Mart, Jim Linklater, with his wife Elizabeth. And Bill Carstairs, also a veterinary surgeon, just retired. Bill had for many years been our North Isles vet and a familiar presence on the island. His wife, Olive, very disappointingly, was unable to be present. Bill was our first Harvest Home speaker when in 1990 the NRCA returned to the old venue of the Memorial Hall. Incidentally, on this occasion, there were three other previous speakers from this period present: Howie Firth in 1991, Willie Tulloch in 1993, and David K. Scott in 1996 — the two latter speakers both local men living outwith the island. Anyhow, as I was saying, this return to the Memorial Hall happened after a lapse of nine years when, for that time, the event was held in the New Community Centre (opened in 1981). So Bill’s return to a Harvest Home after 18 years was a nostalgic trip back in time. Also among the Association’s guests was the band, who had very kindly come from Kirkwall and Stromness to play: Lesley MacLeod. Dave Linklater and Hamish Bayne. There is no building, I think, so appropriate for a Harvest Home as the Memorial Hall. It has real character and one feels completely at home in surroundings that go back 87 years. There is a wonderful dance floor, and no nonsense about using the traditional slipperine — health and safety indeed! Even from the time of Robert Burns and later in Scotland when the sometimes very formidable dancing masters were travelling around the country giving dancing lessons, slivers of wax were used on the various types of floors so as to enable folk to easily turn and glide. After a magnificent meal, that included the mutton of our native sheep, blessed by the Rev John McNab from Sanday, Jerry Wilson rose to give the Harvest Home speech. Jerry chose to deliver the oration in rhyme. He referred to his early days in his native Fair Isle, mentioning the hairsts of those days and his inspiration to become a vet. He went on to expand on a long career as a veterinary surgeon, telling of many escapades and of various amusing episodes when travelling round the farming community. Jerry concluded his very original, and enjoyable, Harvest Home address and invited a company of almost 100 to be upstanding and to toast the harvest. After this tribute to the year’s many bounties, a wonderful birthday cake was conveyed to the main table. This was Ronan Gray’s sixth birthday and after blowing out his six candles the song Happy Birthday to You was sung with gusto. A great dance followed going with a swing and with plenty dancers on the floor. Lesley, Dave and Hamish hardly stopped playing. Sinclair Scott provided pipe music for the two swirling eightsome reels danced. When it came to the raffle Ian Deyell and Evelyn Gray swept through this business which raised £320. Many substantial prizes were available, including one of my watercolours. Then, Jim Linklater, in very brisk form, handled an auction. Being in his element as a professional auctioneer, before we knew where we were he had sold another watercolour of mine for £380. Altogether a very splendid sum of £700 was raised for the Memorial Hall funds. Tea followed, with all sorts of things to eat. Then, once more the dance got under way with a Strip the Willow (what else!) and so continued grandly until the back of two. Auld Lang Syne brought the dancing to a close. Hot soup followed to bring to an end a great Harvest Home. Outside, a full moon illuminated the island. The old folk would have been very pleased as a good moonlit night was generally the chosen time for most events — no cars in those days, just feet and maybe a flashlight or two. I left the “Aald Hut” at 3am, or later, and, as I mostly do, I thought about all those islanders now long gone. Would they, I wondered, come back for an hour or two, with fiddles and melodeon, and relive the great days of the past? I like to think that they might but before the long night was through, they would disappear like the Merry Dancers that shimmer and dance across the wintery skies. Day comes on silent foot, and earth awakes. Within their stackyards farmers come and go. In yonder field the ploughman, leaning low. Furrow on furrow o’er the landscape makes. A quiet mind, and motions calm and slow. Of days and years beside these hills and lakes. Season by season, matching Nature’s mood. I’m beginning this letter as August comes to an end. It’s a day of fresh northerly winds. Those northerly winds are indeed bracing and especially so today as the sun, still fairly warm, heightens the sharpness and pleasure of the day. And, when I looked out to the northwest, the deep blue of the sea – as it becomes at the back-end of the year – is broken here and there with the dazzling white of breaking wave tops. Seventy or more years ago the island would have been thinking about making a start with the old-fashioned ‘hairst’ work. Across the landscape, as September advanced, fields of gold and changing greens to russet browns would soon have been alive with half, or more, of the population at work. Mainly the menfolk cut the corn or oats with their long-bladed scythes. Women would have made the sheaves and set them up to cure and dry. What a sight it would have been, with a hundred or more folk scattered across the harvest fields. But today the fields are mostly all green and hardly a soul is to be seen. Instead of the hard, physical labour of gathering in the crops – made somewhat easier as time passed by reaper and binder – fodder for animals is now managed entirely by heavy machinery – one man to forage, one to transport and one to wrap. Hay, corn and oats have been replaced by grass, with a little unripe corn, or barley-mix harvested later, all wrapped in black, or pale green, plastic. In the space of a lifetime, great changes have taken place – changes such as the old folk could never have imagined. But the social life still goes on and over the past weeks we have had a busy time, and a pleasant time, and I will continue this diary with those varied events, though, also, there have been sad times that I must mention. The weekend of August 18/19, was a busy one. First, on the Saturday, in the New Kirk, four boys – Alexander, Jason, Christopher and Thorfinn – were christened. Graeme and Gina Scott were the parents. The Rev John McNab performed the lengthy baptism ceremony quite delightfully. A nice touch, and I believe a traditional one, was the use of an actual scallop shell to administer the water. With the godparents and partners also present, quite a splendid party of young folk stood round the old christening font. Christenings in North Ronaldsay are certainly very unusual affairs nowadays, and throughout this memorable occasion, one thought kept recurring: what a great pity that this family, who live on the Orkney Mainland, and other families in the same position, and with similar island connections, could not come to live and work on the island. Then we would be in business! In the evening of the same day, as part of a fun weekend, organised by Carole Bayley, Helga Tulloch and Anne Ogilvie, an enjoyable event took place in the Memorial Hall. Anne Ogilvie welcomed a large company of between 70 and 80, which included many folk from the Orkney Mainland. She paid tribute to Carole Bayley, who had died suddenly, only days before, and to whom she dedicated the weekend. Carole, Anne said, would have insisted that the planned events should go ahead. Firstly, we were very grandly entertained to a short concert given by Lesley McLeod, fiddle. Dave Linklater, accordion and Hamish Bayne, concertina. Interspersed with the musical contributions – both individually and collectively – were readings by Pam Beasant of some of her original short poems. Hamish also sang The Silver Tassie. Dancing followed to the lively music of the same three players, with the usual wonderful assortment of refreshments being served. Next day, still in the Memorial Hall, folk gathered for a variety of events: home-grown vegetables were available; a range of items made from the wool of the famous native sheep; souvenirs with a North Ronaldsay theme etc. Many helpers, including Friends of the North Ronaldsay Trust, who had come from the Orkney Mainland, and the North Ronaldsay Community Association, ensured that the week-end was a success. A raffle raised a sum of around £170. Also, as part of the activities, Freda Bayne (textile and wool designer) gave a class in felt design. And, as part of the earlier events, Pam Beasant (George Mackay Brown writing fellow) had conducted a writer’s workshop. The highlight of the day was the signing of John Cutt’s newly-published book, The Way we Were, by the author, who was in attendance. All proceeds from sales are being donated to the Royal National Lifeboat Institution. On Saturday, as part of the Orkney Science Festival, Howie Firth, organiser of the festival, came out to North Ronaldsay to present a very special one-time event to the folk of the island. With Howie was a very fine group of five musicians from Burghead: Saut-Herrin – two singers who played fiddle/mandolin and guitar, another fiddler, a bodhran player and a small pipes player. And from Kirkwall came Lesley MacLeod and Dave Linklater. In the evening, in the new community centre, Anne Ogilvie, on behalf of the North Ronaldsay Community Association, welcomed everybody and introduced Howie Firth. After presenting his guests, Howie began his talk, The Web of Space and Time. Into his talk, he mixed various, fascinating, historical ingredients, along with legends and their connections. There was Walter Scott’s 1814 voyage on the lighthouse yacht round the Scottish Lighthouses; an amazing story from North Ronaldsay’s past (a poem from the sagas still remembered locally in the Norn language in the late 18 century); the work of the great French philosopher and mathematician, René Descartes; and he took a look at the physics of space, and time, with the help of Albert Einstein. Between different parts of the talk, there were short interludes of music, with photographs and drawings projected on to a screen simultaneously. The evening continued in a relaxed style. Flowers decorated tables, illuminated by candlelight in an area made smaller by great coloured curtains to suit the occasion. Music and song followed with easy discourse round the hall. Howie told a hilarious ‘mermaid’ tale from Sanday, which he had composed in verse. Generous refreshments and traditional fare were on offer, and a little dancing took place from time to time. As the evening drew to a close, Anne Ogilvie acknowledged the work of the community association’s president, Evelyn Gray, in organising the event. Well, all those celebrations were greatly enjoyed, but other events had taken place, reminding all of us of how short, unexpected, or inevitable, our existence can sometimes be. On the Orkney Mainland Ronald Swanney, formerly from Kirbist, North Ronaldsay, aged 45, tragically lost his life. He left North Ronaldsay in his early years. He sailed for a time as a ship’s chief engineer. He continued this work as a maintenance engineer but was shore-based. And over the years he became very well known in Orkney for his greatly admired, professional, restorative work on vintage tractors and other machinery. Then Robert Thomson, aged 87, formerly from Peckhole, North Ronaldsay, died in the parish of Rendall. (An appreciation appeared recently in both local newspapers). And, quite suddenly, about a week ago on the island, Carole Bayley died, aged 65. Norman, her husband, and she came up to North Ronaldsay from the south of England eight, or so, years ago. Not long ago I was re-reading J. W. Muir’s little book entitled Island Stories, printed by W. R. Rendall, Stromness, in 1979. There is a verse set to music at the end of his book, with which I will conclude this letter. I was thinking that this verse would be very appropriate as those three islanders, each in their different ways, loved North Ronaldsay. Two were, as one says, born and bred, on the island, and the third was a new islander. As the days pass at such times life goes on. The seasons follow, one by one, and the generations come and go. But the island never changes all that much. Little island of blue and soft green. Where in the summer the arctic terns wheel and sail in the sky. And the seaweed-eating sheep follow the ebbing tide … Goodbye. Somebody told me the other day that the summer holidays are almost halfspent. That can’t be possible I thought, but when I considered for a moment and looked up my diary I saw that the school’s end of term open day, which usually heralds the beginning of the school’s summer holidays, actually took place on June 28. So now I see that as we get older time appears to get shorter. What seems like two weeks is nearer four, and two years becomes four or five or more. In any case, the school’s open day was as enjoyable as it always is. An informative selection of work was on view. There was the term’s project work — a study of the Romans; pupil target folders; examples of creative writing — computer and hand-written work, etc. Pupils Duncan Gray, Gavin Woodbridge, Cameron Gray and Ronan Gray (Primary One) had obviously been well motivated. Lilly Gray, nursery section, had also been having a constructive time. On view were projected video stills and photographic displays showing the three older pupils’ visit to Caithness. They had been to the Wick Heritage Centre, to the Thurso football pitch, to Stroma by speedboat, a re-cycling centre, on a sea-fishing trip and enjoyed quad bike rides. Ronan and Lilly, on a visit to Kirkwall had seen the hospital, fire station, Kirkwall lifeboat and the Pickaquoy Centre. Add to all of that swimming and collaborative joint-school work such as in drama productions and art. In the main community hall an exhibition of quite impressive art work was on view from Papa Westray, Eday, Flotta, Rousay and North Ronaldsay. This collaborative effort between the different islands is a great idea, as are the visits made to the Mainland and further afield. So, head teacher, Sue Gilbert, had done great things with her pupils. This was acknowledged when, as reported recently, HMIE inspectors applauded the versatile range of work provided and the effective leadership of the head teacher. Praise was given to all aspects of nursery provision. Commendation must also be attributed to support teacher Anne Ogilvie (Anne took over mid-term from Sheila Grieve, who had taken early retirement) and nursery early-years worker Marion Muir. Having begun by looking back, I think I will continue my letter as a sort of extended ‘here and there’ dairy. Readers of The Orcadian and Orkney Today would have seen the very comprehensive coverage (with many photographs) of the North Ronaldsay Folk Festival. That weekend coincided with the opening of the £4.5m redevelopment of the Pier Arts Centre in Stromness. This was a special occasion with some 400 Friends of the Gallery, funders and exhibiting artists attending the public opening. My mind had been made up earlier to be in Stromness for this event, so off I flew by Loganair on a day of sunshine and banks of shifting, rolling mists. How very grand it was to be in Stromness again, strolling up or down the “hills and dales” of the friendly old town. Still to be seen preserved in Stromness, are parts of the original cobbled streets of past times. I had a Stromnessian friend who walked along with me answering my questions about this and that, or pointing out places of interest or of historical importance. Such as, for example, the Lieutenant’s house (built by Lt James Robertson RN, who commanded HMS Beresford at the battle of Plattsburg in 1812); the Lighthouse shore buildings where generations of lightkeepers’ families once lived; the remaining gable-end of a house where long ago a blacksmith worked away on his forge — part of its chimney can still be seen in the gable; the cast iron pier head fountain, where once horses drank. The fountain bears a plaque commemorating Alexander Graham. It was he who led the fight against an excessive, debilitating trading tax levied on Stromness traders by Kirkwall. Though successful, Graham was forced into bankruptcy as a result of his efforts and died, seemingly, in poverty. As we made our way down to the harbour who should I meet but a lady from the past. Years ago, she lived for a time in North Ronaldsay where her husband was a lightkeeper. And another acquaintance from more recent times — also with a lighthouse connection — was the son of the last principal (before automation), of the North Ronaldsay Lighthouse, now a successful owner of a taxi business. But I have strayed a little from the Pier Arts Centre. It has now become a truly magnificent building and a great centre for the Arts. The opening was a splendid affair with further celebrations in the Stromness Hotel. In Kirkwall, earlier last month, I visited the Orkney Museum and the Kirkwall Town Hall to see the retrospective exhibition of paintings spanning the life and career of Dr Stanley Cursiter RSA RSW (1887 – 1976). I must certainly go back again. Janette Park, Social History Curator at the Orkney Museum, with much work and dedication, over a period of two years of research and fund raising, had organised this tribute to Stanley Cursiter. Janette is an ardent admirer of Cursiter and at university wrote her dissertation, for her MA in the history of art, about the artist. This great Orcadian was indeed a man of many talents, with many honours to his name, not least being the Queen’s Limner in Scotland. He was a masterful painter of portraits, of royalty, and of many others holding positions of importance or of some high office. Once, Stanley Cursiter showed me an album in which was a photographic record of very many, if not all of his portraits. As he said, there were Lord Provosts, bishops and generals, university professors and chairmen of companies. The exhibition includes examples of his fine portrait work, drawings, etchings, and a spectacular still life study in black and white. And then there are his magnificent paintings of Orkney’s sea and landscape a number of which Janette had been able to acquire on loan for the exhibition. The Orcadian landscape is beautifully captured and in the seascapes one almost hears the sound of the sea and feels the wind and sun. One such painting is a powerful seascape entitled Surf. This was his RSA Diploma piece (1937). 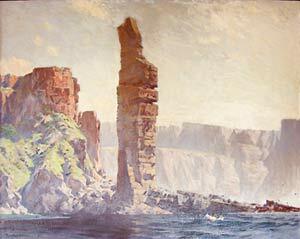 Another great painting (to be seen in the Town Hall) is his impressive and atmospheric interpretation of the Old Man of Hoy (pictured on the right). Anyway, back home from Stromness I came. For days since, when the weather was suitable, the wrapping of round bales has been going on apace. As I write, Sunday, July 21, two weeks or so later, this silage work is about complete. Shortly, it will be punding time, when the native sheep will be shorn of last year’s coat of wool and the County Show is not far away. So, you see, we are almost into the Market time of year when the nights are beginning to draw in once again. Yesterday was a magnificent day with bracing, droughty, northerly winds and the sun shone with some brilliance. Grass-wrapping machinery was going at it here and there and heavy tractors roared. It was a pleasure to be out and about and I myself, pursuing a more sedentary occupation, set about painting a bit more on a Nissen hut. Then it rained at night. Today has been mixed but now, at night, it’s raining once again and heavily. But Orkney can’t complain if we think about the unbelievable rain, floods and unseasonable weather experienced further south. Well, here I am sitting outside my front door this Monday morning finishing off this letter. It’s sunny and warm for the moment. Bluebottles are darting here and there. Their buzzing reminds me of days long ago when chests of clothes and all manner of interesting things were brought outside in the sun to air. In the garden, sparkling little beads of last night’s rain decorate the leaves of the montbretia like scattered jewels. A curlew is piping in the distance and some gulls are calling and wheeling high in the sky — more rain I shouldn’t wonder. From time to time a young family of swallows sweep and bank at high speed round the house, as they hunt for flying insects, and a little wren is singing cheerfully on a nearby dyke. Here I am again beginning a letter just a day or two before May comes to an end. When I was writing my last letter but one — back in March — my inspiration came from a visit to the gardens of Holland House. There I reminisced about earlier times. So pleasant was my sojourn that I resolved to return when the bluebells came into bloom. Well. I did go there one day fairly recently and, once again, sat myself down in the old slated seat from the past that had made me think about the North Ronaldsay of long ago. In April we had a great night in the Memorial Hall the coverage of which constituted my last letter. So on to this day. It began fairly quietly, then rained, and now, there is a gale of southerly wind which got up during the afternoon. All of a sudden the east side of the island presents a stormy scene indeed. From the North Riff to the South Riff— an offshore underwater reef extending for around a mile or more—waves are breaking surprisingly heavily for such a short onslaught of wind. Linklet bay is alive with broken water and on the shore, long sweeps of surf keep rolling landwards. In the fast-changing evening sky, clouds fly northwards exposing sudden flashes of bright sunshine. Those waves of light come rushing across the island — sometimes from far out at sea — to lighten up the grass, like a brilliant searchlight, to an intensity of differing greens that almost dazzles the eye. At the same time dykes, houses and fencing posts, which crisscross and dot the landscape, change colour and stand out prominently in the passing surges of sunlight. This weather must be the belated Gabs o’ May (stormy weather usually early in May). Another expression, which probably means the same, is the ‘ku-kwacks’. Hugh Marwick, in the Orkney Norn, describes them as stormy, blustery weather that comes often in May. Not many days ago, the wind was in the north. Very cold and unpleasant it was, with rain and even sharp showers of sleet and hail dancing madly among the daisies and the dandelions. So the old proverb: “Cast not a cloot ’til May be oot,” is still good advice. Mind you, earlier in the month there were some fine, bracing days with intense sunshine and we were lulled into thinking that summer had come. Since those misleading times there have been days and nights of cold rain and wind reminiscent of ‘back-end’ weather. Just to liven us all up recently, artists from the 25th Orkney Folk Festival visited the island to give a concert — as they had done in other neighbouring islands. All of this has already been covered in our local papers so I won’t dwell on the event. Particularly satisfying though, for me at least, was the opportunity to hear and enjoy the music and singing without the often unpleasant and detracting amplification that seems to be synonymous with such events. Why, for heaven’s sake, must everything be amplified to such an unbearable pitch? Of course the judicious use of a microphone is helpful — even necessary — when, for example, a fiddle is in competition with the more powerful accordion, or a singing voice is backed by various instruments including drums. But no, up goes the volume until one could comfortably take a seat half a mile away in the open air and still hear everything — I know there are others who feel the same way. Anyhow, the community association had created a cosy atmosphere with the decoration of the community centre. Use was made of coloured curtain material, coloured light bulbs, candles and vases of flowers to transform the interior. Various refreshments completed the enjoyment of the evening. As I write I can hear the whistling and moaning of the wind. I’ve just been outside to inspect the weather. How swiftly everything changes. The sky is now almost clear, and the moon, not very high up in the southern sky, is within a day or two of being full. She really commands attention. In the west Venus is as bright as a button. It’s just too dark to make out the condition of the sea, though I can just, from time to time, see the ghostly appearance of the heavier breaking waves. Over the night air I can smell the tang of the sea. It must partly be the churning up of old ‘brook’ — masses of seaweed or ‘ware’ that lie along parts of the shore decaying in the spring and early summer. It’s a smell that is particularly nostalgic for me, for around this time of year, over 40 years ago, it always brings to mind a day when the creel boats put out to sea. I wrote about those days in a two-part article on traditional lobster fishing published in The Orcadian in 2000. The wind was easterly on that day of far-off memories. The same smell of decaying brook pervaded the early summer air, and the creel boats were first setting their drifts of creels for the season’s fishing. I find it quite sad to think of those vanished times. Only in our minds or dreams do some of us ride the waves with the salt sea flying and the cold spray tingling the senses. And only in our dreams do we set our creels in those old lobster-promising leys, slunks and trinks and well-remembered waters. Yes, I went to Holland’s gardens and on my way I picked a display to bring home with me of my very favourite flower, the old fashioned lily, or the narcissus to be precise. The primroses had gone, though among some of their pale green leaves, magical little forget-me-nots pleased the eye instead. But the bluebells were wonderful to view with their faint but special fragrance. Great clusters held sway among the tangle of trees and it was enjoyable just to wander here and there and savour a feeling of, I suppose one could say, a world apart, since no other large gardens exist on the island. There the birds sing and tree branches faintly creak in wafts of wind. In corners, open spaces and among the trees New Zealand flax adds to the strange, exotic mood of those almost forgotten gardens. In their heyday they must have looked spectacular. Back across the mown lawn in front of Holland House, I went to my old seat once again. I could see the same view as that fine day in March, though this time round it was early evening with the sea dancing in the west instead of the south, and the sky was the colour of the little forget-me-nots. A few faraway clouds stretched, unmoving above the islands, slightly hazy in the distance, and the Red Heads of Eday were instead a faint misty purple. Yet the blinding reflection of a still powerful sun made me half close my eyes when looking westwards across the dark blue of the sea. And looking back across the North Ronaldsay Firth, not far off the nearby point of Stromness, ebb could be seen jumping in the face of the fresh south-westerly wind. So in this way, I took in the sights and sounds of North Ronaldsay. Linnets and little wrens were singing all around. A blackbird sometimes would whistle. They sing a very melodious tune you must admit. It’s a pleasure to sit quietly and just listen. In the distance, as before, curlews, lapwings and oyster-catchers were calling. And above me a solitary tern went clip, clipping past in a businesslike way with an occasional warning cry. Maybe we should interpret that cry as one of desperation instead, for now the little terns can hardly find sufficient food to bring up their families. And that magnificent bird, the puffin, with its rainbow coloured beak — which we sometimes used to see winging past during days at the lobster fishing — can no longer find enough feeding of the right kind for its offspring. Instead, without realising the horror of their efforts, they feed, I believe, a type of pipe-fish that chokes their young. What is to become of us all if this sort of tragedy and far more serious ones are to continue as a result of our unchanging, selfish ways, I wonder? Time to make for the bed I think, as it is certainly well past the ‘heuld’. It’s going on two in the morning to be precise. I took one more look outside. To my surprise the moon has quite disappeared and the sky seems to have taken on a sort of all-enveloping grey, misty haze. The wind has backed into the southeast and the sound of the sea carries loudly across the half mile or more that stretches from Antabreck to Linklet bay. Maybe this summer storm will be short-lived, as they usually tend to be. In any case, as they say, “tomorrow is another day”. I will finish with one verse and a chorus of a sea shanty that caught my fancy at the island folk festival mentioned earlier. The group Fridarey, from Fair Isle, with Martin Curtis (New Zealand) sang the song, Mollymauk—another threatened species. It is, of course, that great bird of the southern Atlantic Ocean – the albatross. Where the storms are many and the shelter’s scarce.